Drama students at The Sixth Form College, Solihull are rehearsing for a Shakespeare Comedies showcase in June. 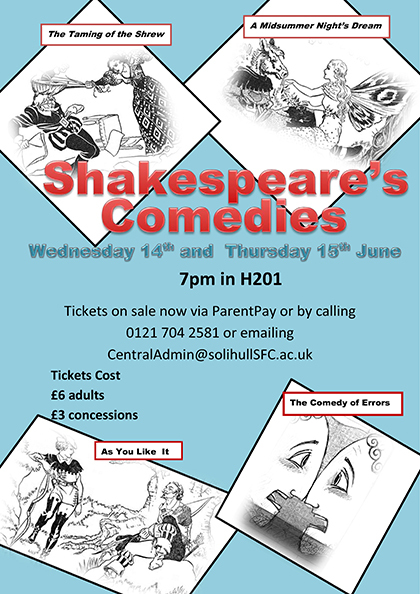 First year A level Drama students will be performing extracts from four of Shakespeare comedies on Wednesday 14 and Thursday 15 June at 7.00pm start ion the College Theatre H201. The comedies in the show will include ‘The Taming of the Shrew’, ‘A Midsummer Night’s Dream’, ‘As You Like It’ and ‘The Comedy of Errors’. Tickets are currently on sale, priced £6 for adults and £3 for concessions, and are available to current students on the Parentpay website or from the Central Admin Office in Meriden building. Others are asked to call 0121 704 2581. Drama students at the College are fortunate enough to use three professionally-equipped studios for rehearsal and staging finished work and get plenty of support from dedicated and experienced Drama staff, who are always extending students learning with additional trips and workshops to contemporary theatre practitioners.